Internet edge mobility has been possible for a number of years: mobile IP, allows a host to change its point of at- tachment to the Internet and NEMO  allows the same functionality for a group of hosts along with a mobile router. The virtue of NEMO and mobile IP is transparency: a host remains identifiable through the same IP address, and traffic sent to that IP address will be tunneled to arrive at the intended node. NEMO allows “nested networks”: a mobile network which attaches to another mobile network to arbitrary depth. However for each level of nesting, traffic is encap- sulated and tunneled to reach the destination. This leads to increased overhead (encapsulation) and to sub-optimal paths (tunneling without consideration for the actual net- work topology). 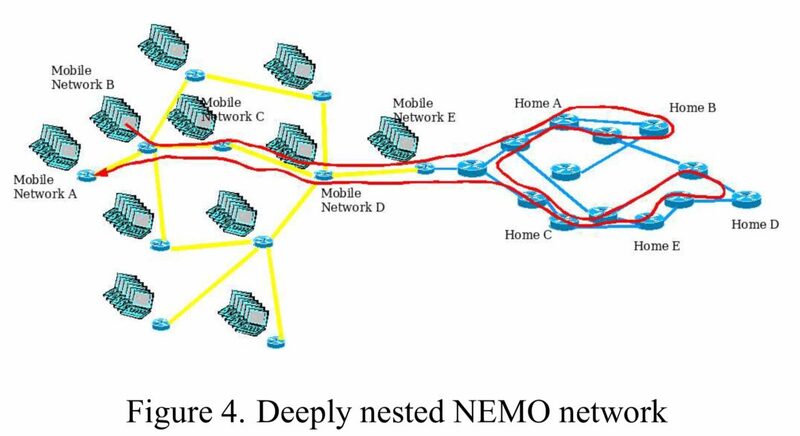 In this paper, we investigate route-optimization in nested NEMO networks. We employ an ad-hoc routing protocol between mobile routers to ensure shortest routes when both source and destination for traffic is within the nested NEMO network. The mechanism also simplifies the requirements for route optimization when the source node is located outside of the nested NEMO network.